Kemp is Steven Player, a remarkable dancer but also an actor blessed with a proper comic’s features: wry but benign, heavy-browed, with a quick impatient self-mocking cleverness. He puts on a stunning show from start to finish, a marathon of virtuoso hoofing. 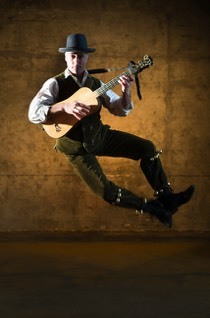 Jeremy Avis sings the solos with a light happy versatile tenor but is – like several other musicians – startlingly willing to join dances, or indeed fights, when required. And all the while Salaman and her ensemble are insouciantly picking up or changing instruments. It roars along. The Strange and Ancient ones head off now for one-night gigs ... and it’s worth trying to catch them. You won’t find anything else quite like it.